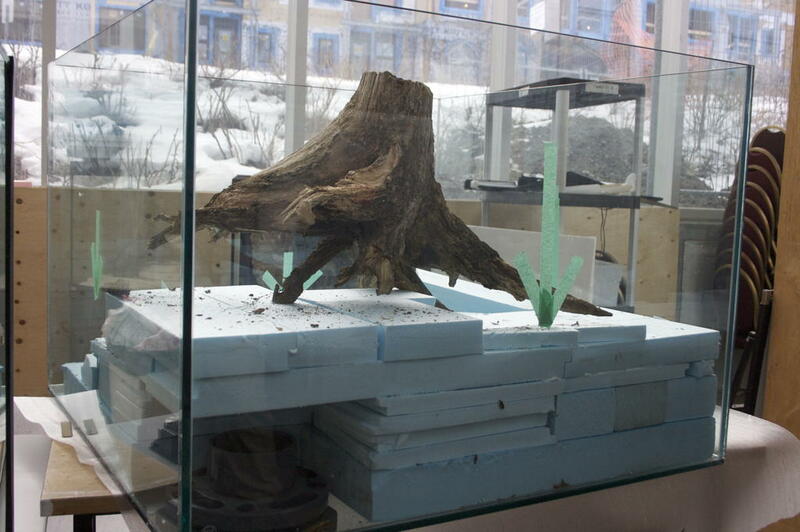 The glass tank, Styrofoam layers, and wooden stump that will form the spotted turtle habitat. The new tank for the freshwater fish is in place, but the turtle tank is still under construction behind the scenes. Whereas the fish tank arrived at the museum pretty much ready to be filled with water, the staff members have taken a more active role in designing and building the turtle habitat. And it has involved a bit of testing and experimentation. First the staff had to make sure that the materials they ordered, including the glass that will make up the walls of the tank and the glue that will hold them together are not toxic to the turtles. All materials give off some chemicals, and the staff couldn’t just take the manufacturer’s word that the products were safe. So they built a prototype tank in the Animal Care Facility to determine whether or not the turtles could tolerate the components of their new habitat. They also had to design the habitat so that water could circulate through it efficiently – if the water doesn’t flow properly, its chemistry could change, and that would be bad news for the turtles. Now they are working on making the habitat look like a true “slice of nature.” This means designing the interior so that all of the lights and components of the water filtration system are hidden from view. That way, museum visitors can focus on spotted turtles and not on the inner workings of their habitat. This entry was posted in Water and tagged spotted turtles, turtle habitat, water exhibit. Bookmark the permalink.